The World’s Easiest Flying Airplane? 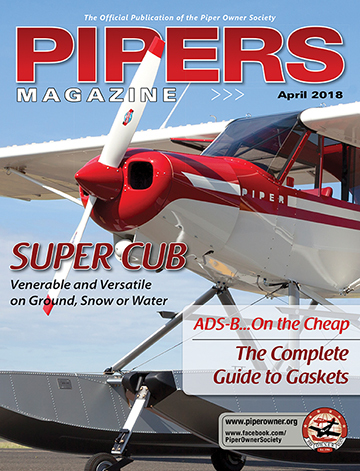 Evidence that the Piper Cherokee 180 may be the world’s simplest airplane to fly is more than anecdotal. When the clouds hang low and the fog rolls in, my hangar in Southern California seems to attract a group of pilots who like to sit around and debate such questions as why the president needs to shut down all VFR traffic at 32 airports within 30 miles of LAX every time he visits the L.A area. That’s obviously a question we’ll never have an answer for, but there are other pressing problems that we can at least debate logically without anyone wanting to throw something. Recently, the hangar hangouts were curious as to the consensus on the world’s easiest-flying airplane. How you answer that question is highly subjective, depending upon what model helped guide you to the Private license. If you learned in a Skyhawk or a Cherokee, chances are, you’ll vote for that model in the debate. If your personal mentor to a pilot’s license was a taildragger, there’s a good chance you’ll swear by that type and, inevitably, decry anything with the third wheel out front. Most of the time, however, arguments will devolve to whether you learned in a high-wing or a low-wing airplane. That debate is usually less contentious than the nosewheel/tailwheel argument. Pilots trained in high-wing machines most typically gravitate toward the same type, whereas aviators educated in low-wings tend to disdain airplanes that mount the wing above the fuselage. There were/are exceptions, of course. Pilots of high-wings tend to lose their perspective of the airport during the critical base and final turns, while low-wing advocates can see into the turns all the way around the pattern. I spent most of my early apprentice days (I’m now in my late apprentice days) flying a Champion Tri-Traveler, basically a 100-hp, tricycle-gear version of the Champ. The Tri-Traveler wasn’t a big success for Champion Aircraft. It was essentially a Champ with a nosewheel. The company sold only about 500 Tri-Travelers. Apparently, so many folks regarded the original Champ taildragger with such reverence that there wasn’t much enthusiasm for a nosegear version. The original Champ went on to fame and relative fortune in the Bellanca and later, the American Champion line. For better or worse, someone wrecked the Tri-Traveler at my school, and I transferred to a Piper Colt, again a variation on a previous design, in this case, the Piper Tri-Pacer. I did earn my license in the Colt, then, almost immediately switched to a Cherokee 180. The “big” 180 had a 40-inch-wide cabin up front, could carry four folks (more typically two plus two), had enough power to aviate a couple miles above sea level, and was generally a more satisfying machine to fly. In fact, by the time I’d saved enough money to purchase a well-used Globe Swift a year after passing my checkride, I’d actually begun to appreciate the Cherokee 180’s finer talents. The 180 and I spent probably 50 rental hours together in that first year, and since the airplane’s primary mission was to provide me with four seats that allowed me to aviate with a quartet of folks in the buckets and protect me from major evil during the landing phase, I came to respect the Cherokee 180. It was a durable little machine that always seemed willing to find another cheek to turn to the ham-handed semi-competence of a newly licensed pilot. The Cherokee 180 had the simple, rectangular, Hershey-bar wing, it had a stall that was practically undetectable, and it was about the easiest machine to land I’d ever encountered. In fact, the 180 was often criticized as having a stall that was too docile and not complying with the FAA’s aerodynamic pre-stall warning requirements. The 180 and I, along with my wife and usually two brave friends, bounced all over California, Arizona, and Nevada, flying to air shows, hamburger joints, an occasional steak house or traveling to visit friends who acted dutifully impressed by the shiny little Piper. For me, the Cherokee 180’s major benefit was that I couldn’t seem to make a bad landing in it – and believe me, I tried. Never seemed to have that problem in the Tri-Traveler or Colt, but the Cherokee 180 was so docile and forgiving, so willing to excuse my regular transgressions, that it always made me look good in front of my friends. That, of course, was one of the primary goals of any new pilot, a smooth landing and the chance to look like Sky King (in case anyone remembers him). Takeoffs were critical, as well. I vividly remember an instance at Big Bear, California (elevation 6775 MSL) when I departed with three trusting souls on a wonderful July day at, oh maybe 70 degrees or so. Yes, I did know about density altitude, but apparently, the airplane didn’t. Fortunately, the prevailing winds favored the runway that departed directly out over the lake. I lifted off, climbed about 50 feet and mushed out over the water. My wife and two friends in back thought the buzz job I was giving the boats on the lake was great fun. Everyone was waving and having a good time. I didn’t share their enthusiasm as I dodged the boat masts, clawing for altitude to clear the power lines at the end of the lake. No, I never told them how close they’d come to oblivion. But, perhaps in recognition of my amateur status (that some believe persists to this day), the Cherokee 180 never let me down unexpectedly. Its 180-hp Lycoming O-360 engine and fixed-pitch prop ran smooth and consistent, generally providing nearly enough power to keep me out of trouble. I explored much of the Southwest in that airplane, carrying me and my unsuspecting passengers to places they’d never been before, and often to places I didn’t recognize either. In retrospect, I made most of the mistakes that you’re usually only allowed to make only once, but I made them several times. The 180-hp engine was more than adequate to the task. No one ever caught me doing anything wrong and no metal was ever bent. That’s a more common bottom line than you might imagine. When we’re baby birds, we appreciate that flying has some inherent dangers, but we know just enough to think we’ll be able to avoid them. Apparently, I’m not the only pilot to think warm fuzzy thoughts about the Cherokee 180. 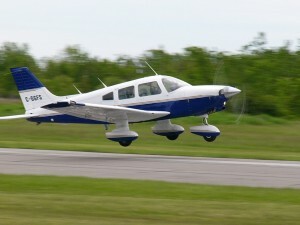 More than coincidentally, a variation of the PA28-180 is still being produced at Piper’s factory in Vero Beach, Florida. No, production hasn’t been continuous over the last half century, but the very fact that Piper continues to build the Archer says much for the model’s staying power. The Archer is the current version of Piper’s everyman’s, four-seat single, and it continues to attract flight schools as well as private owners. Of course, today’s airplane is a far cry from the Cherokee 180 of the 1960s. The 2014 model features Garmin flat panel avionics, a thinner, semi-tapered wing, and enhancements in every area, but the basic fuselage and airfoil remain very much the same as on the original. The airplane I flew right after the rating was a relatively new 1964 Cherokee 180, fitted with all the appropriate avionics of the day. It had a pair of Narco Mk 12s, an ADF, switching panel, and even a Narco autopilot. My notes from those days suggest it weighed in at 1390 pounds against a 2400 pound gross weight. That left 1010 pounds for useful load, and a very respectable 710 pound payload. My flights were nearly all with four folks aboard (the better to split the hourly cost), so I was flying near gross on practically every trip. Despite that, the airplane turned in a reasonable 700 fpm from sea level, and I could usually count on about 115 knots at 6500-7500 feet. The four-banger Lycoming seemed to be happy when leaned out to 9.5 gph, and with 50 gallons aboard, I could make cross-country hops of 4.5 hours, worth right at 500 nm at a sitting with a 45-minute reserve. Drift on up to 10,000 feet altitude, lean the mixture for 55 percent and you could extend that another 50-75 nm. My memory may be failing after the intervening 45 years, but it seems we visited pretty much every major port of call in the Southwest; Phoenix, Tucson, San Francisco, Las Vegas, Reno/Tahoe, Sacramento, not to mention other fun destinations such as Grand Canyon, Death Valley, Lake Powell, and Lake Havasu. The Cherokee 180 was my escape machine, and if I remember correctly, it facilitated my escape for only about $25/hr wet. Remember, this was 1968. In fact, economy has always been one of the Cherokee 180’s strongest recommendations. It’s such a simple airplane that anyone can fly it, the direct drive, fixed-pitch prop is uncomplicated and relatively bulletproof, and the airplane itself is as reliable as a Timex. Of course, all that was many years ago when I was young and naïve, willing to believe all the myths of aviation and convinced I could live forever. Since then, I’ve moved on to twin engines and turbine power. I’ve come to appreciate the talents of jets and helicopters and amphibians and gliders. But, it all started with the little Cherokee 180 that helped teach me to fly in 1966. Like all Cherokees that have gone before and since, the Cherokee 180 gets my vote for the easiest-flying airplane in the sky. All specs and performance numbers are drawn from official sources, often the aircraft flight manual or the manufacturer’s web site. On used aircraft, common sources of information are Jane’s All-The-World’s Aircraft or RVI’s Aircraft Bluebook Price Digest.